Great Writing Tools | Breezy Mama Breezy Mama - Expert parenting advice, celebrity interviews, product reviews for kids, moms and babies and more! I have a confession to make. When I like a pen, I take it. No, I’m not talking about shoplifting from a store, I’m talking about pens that are out and about for you to use–a hotel room, the bank, a restaurant–those kind of pens. (But just so you don’t think any lesser of me, I do replace the good pen with whatever I have floating in the bottom of my purse.) Why do I take pens? Because, a good pen is pure joy. It makes writing enjoyable, not a chore. It gives you a sense of giddiness. 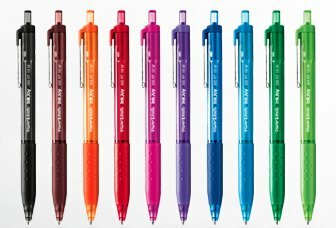 So I was the exact target market when PaperMate introduced their new pen, the InkJoy, which was centered around a marketing campaign of “don’t let the pen thief get it”. The sample pens even came with their own safe to be stored in, so if you worked in an office, they couldn’t be swiped–because the InkJoy is exactly the kind of pen that a person like me would swipe. The colored ones above are the InkJoy 300 RT. They feature a rubberized grip for pure writing comfort and a tip with no dragging, delivering crisp, clean lines. I love the colors that they come in as well–each is vibrant and easy to read. And, they’re great for when you need to a kid to be quiet while you work . . . “If you’re verrry careful and very quiet you can use Mommy’s special pens to draw.” Not that I’ve ever stooped that low. . .
To see the entire line of InkJoy pens, click here.